This one took a moment to get right. While listening to our customers, competitors and tactical operators alike, we achieved a crystal clear true 1x to 6x performance driven optic. With the implementation of the proven glass etched P7 reticle - this optic is ideally suited for the AR platform for use in short to medium range applications with most any caliber. Packed with a TON of well thought out features - the performance profile of this optic truly exceeded our expectations with edge-to-edge sharp, crisp image resolution through the entire magnification range. The eye relief is generous and forgiving providing a clean and expansive field of view even under less than ideal shooting positions. 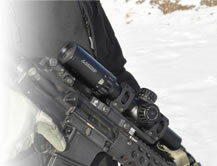 In close quarters the operator will enjoy a true 1x, no magnification sighting image presentation allowing the optic to be run with both eyes open increasing the situational awareness. With an ocular focus and a reticle illumination in the calming LUCID OPTICS blue, the target acquisition has never been easier in any light condition. Built on a very durable 30mm aircraft grade one-piece tube construction, the 1-6x24 is built to take the abuse of a serious operator and ask for more. The windage and elevation turrets offer 60MOA either side of optical center set with our easy to use lift, adjust, press down to lock design that is highly accurate and durable with re-zeroable turrets. 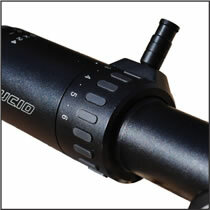 The 1-6x24 offers an operator selectable magnification lever for fast changes to the zoom function. When you are looking for a well-rounded and full featured optic for the tactical use, look no further - the LUCID OPTICS 1-6x24 will not disappoint. With the P7 reticle also set in the crystal clear and precise LUCID OPTICS L7 optic, the operator no longer needs to be unsure of their shot placement over distance. Like the proven L5 reticle, the P7 reticle is a simple MOA measuring tape with useful hold over increments set 8MOA apart. Now the P7 reticle is set on the second Focal plane. This is done intentionally to allow the operator to be able to back off the magnification and gain substantially more distance in target striking capability. By backing off the magnification, this changes the field of view and increases the “Hold Over” distances available to the operator in the field of view, meaningful and precise. This reticle still shines in fast target acquisition. 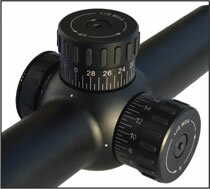 The sighting circle with the framing wedges allow the operator to gain a precise hold on the target very quickly. The P7 reticle also provides meaningful wind estimation dots to reference while shooting in less than optimal conditions. With the immensely useful addition of having the reticle available in STRELOK, the operator now can have exact ballistic data for spot on ballistics no matter what platform the P7 reticle is used on.